* Mack’s Lure Pip’s Leader Dispenser for holding all the rigs perfectly without tangling. ONCE YOU HAVE THE above ingredients it is time to snell the hooks. If you do not know how to snell a hook, look it up on YouTube, a great source for learning the correct method of tying up all kinds of hooks. You can also look up bumper tie and egg loop tie if you would rather have a loop in the hook for eggs in a river that allows bait. The Methow and Wenatchee don’t, so I just snell the hooks without an egg loop. 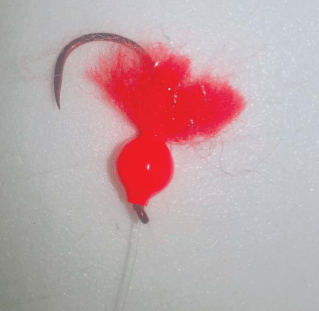 Basically a snell is tied the opposite way an egg loop is, from the back of the hook towards the eye, and over the top of a straw or something that the tag end can be inserted back into so that it ends up underneath the loops. I tie the leader about 44 inches long for the simple fact that if I tie it longer, it will not pull out of my leader dispenser very easily. I drift fish 36- to 42-inch leaders. Pulling yarn into a Corky is a pretty clever trick. I learned this method by accident a few years ago when I was getting tired of tying yarn into my egg loop. I will slide the smallest Corky that Yakima Bait makes up my octopus hook and thread an independent loop to catch the yarn, as shown in the picture on the next page. I will place the right amount of yarn in the loop so that it jams tight into the drift bobber. If the yarn goes in too easy, it will fall out. I will pull the yarn all the way to the other end of the Corky and pull the independent loop of line out of the yarn when I am done. I will use a drop of Super Glue Gel on the snelled hook and pull the Corky with the yarn jammed in it all the way to the top of the snell. The picture at bottom right shows a cute little Corky bug on the hook. The steelhead love this Corky yarn bug. Just don’t let the yarn go past the hook shank. Steelhead will short bite you all day long if you do. You can follow the same steps to jam a chunk of yarn into a Corky for anywhere on your line. The yarn jams so tight that it acts like a bobber stopper. 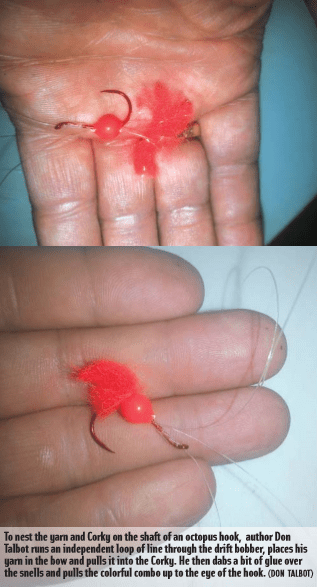 Fly fishermen are using this method for strike indicators as well. Just make an independent loop closest to the hook with 8-pound-test line and place a fatter chunk of yarn in it so that the yarn jams hard into the Corky. 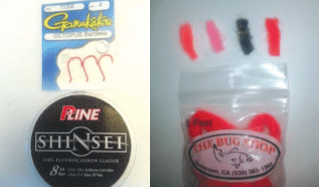 After you are done tying, say, a dozen rigs, it’s time to make some slinky set-ups. If you don’t have the parachute cord and lead BBs to fill the cord to make your parachute weights, buy some Danielson slinky weights in a variety of sizes. I will cut down the 1-ounce weights to make three or four smaller ones. You can save money cutting up the longer weights and burning the ends and reclosing with a pair of piers. I run my mainline through the eye of a cheap No. 10 crane swivel, which also holds my slinky weight. Between that and a small, roller-bearing barrel swivel connecting my mainline to my leader, I include a black 5mm bead. THE TALBOT CORKY-YARN RIG is simple, as is my North-central Washington steelheading vest. I like to take just my Pip’s Box and a small components container when I drift fish. I don’t need a tackle box, period. Enjoy all your new creations with jamming yarn into a Corky. It really makes my rig fish a whole lot better! Editor’s note: While the Methow and Okanogan Rivers opened Oct. 15 and the Similkameen River opens Nov. 1, WDFW had not announced a season for the Wenatchee as of press time last month.